Following the end of the consultation exercise, a report has been prepared analysing the comments received and officers’ recommendations. This report has been presented to the Director of Regeneration and Planning who has made a decision to proceed with the scheme. The report is provided in the link below. 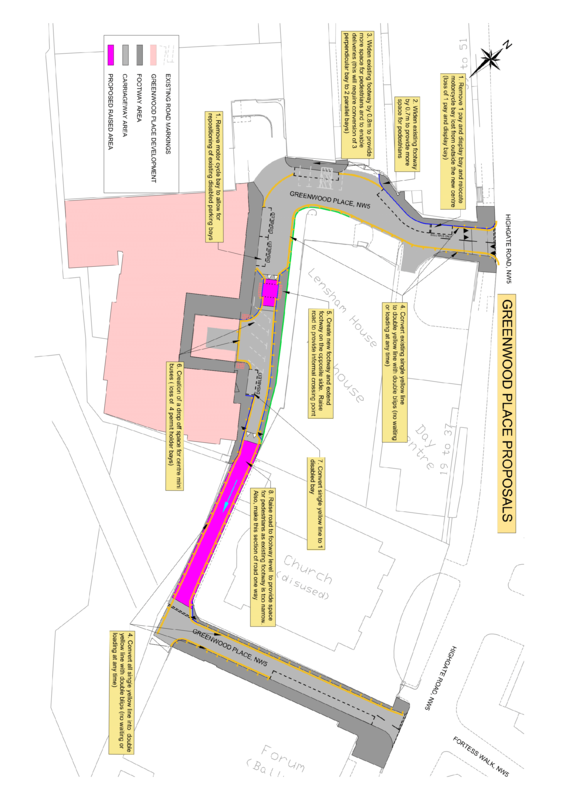 We are writing to seek your views on the Council’s proposals for improving safety and public realm in Greenwood Place. Greenwood Place, which can only be accessed from Highgate Road, will be home to the newly developed Community Resource Centre which is Camden’s first ever centre for independent living led by disabled people for disabled people. To complement this new development there is a need to improve accessibility for users. The centre is currently under construction and is due to open in autumn 2018. Greenwood Place presently accommodates both business and residential units. The current use of the road is relatively low both in terms of motor and pedestrian traffic, however pedestrian numbers are set to increase once the centre opens. The proposed measures are outlined below with a drawing included (see attachments below) to further illustrate the proposed changes in detail. There will be an overall loss of 5 permit holder spaces and 1 pay and display space, which is due to the rearrangement of existing spaces, inclusion of 1 new disabled bay and the introduction of a new footway on the opposite side to the centre where presently there is none. 3. Widen the existing footway outside Highgate Business Centre to provide additional space for pedestrians and to assist with deliveries. In addition, re-align three existing (perpendicular) permit holder spaces into two parallel spaces. 5. Create a new footway outside the centre and introduce a footway on the opposite side to reduce crossing distance. In addition, raise the carriageway to footway level to provide an informal crossing point. 6. Creation of a drop off space for buses using the centre. As a result, there will be a loss of four permit holder spaces. 7. Convert single yellow line to one general disabled bay to the east of the proposed drop off area. 8. Raise road to footway level (immediately east of the new development) to create shared space as existing footway is too narrow. This section of road will become one-way for vehicular traffic. If approved the above proposed measures will be implemented in October 2018 and all the proposed changes are being funded by the developer secured under a Section 106 agreement. The Council will be pleased to hear your views on the proposals as well as any alternative suggestions or objections you may have to any aspect of what we are proposing. All properties located close to the proposals, local groups, statutory groups and ward councillors. While it will not be possible to reply to your individually, all comments will be taken into account. At the end of this consultation period, officers will consider all responses received and write a report with recommendations. This report will be presented to the Director of Regeneration and Planning (Supporting Communities Directorate) who will make a decision whether or not to proceed with implementing the proposals. Under the Local Government Access to Information Act 1985, your consultation response will be available for inspection if required; however, your personal details will remain confidential. Please only write to us with matters associated with this consultation. If you do have any further questions or require clarification about the proposed scheme, please do not hesitate contact Adam Iqbal on the above contact details.